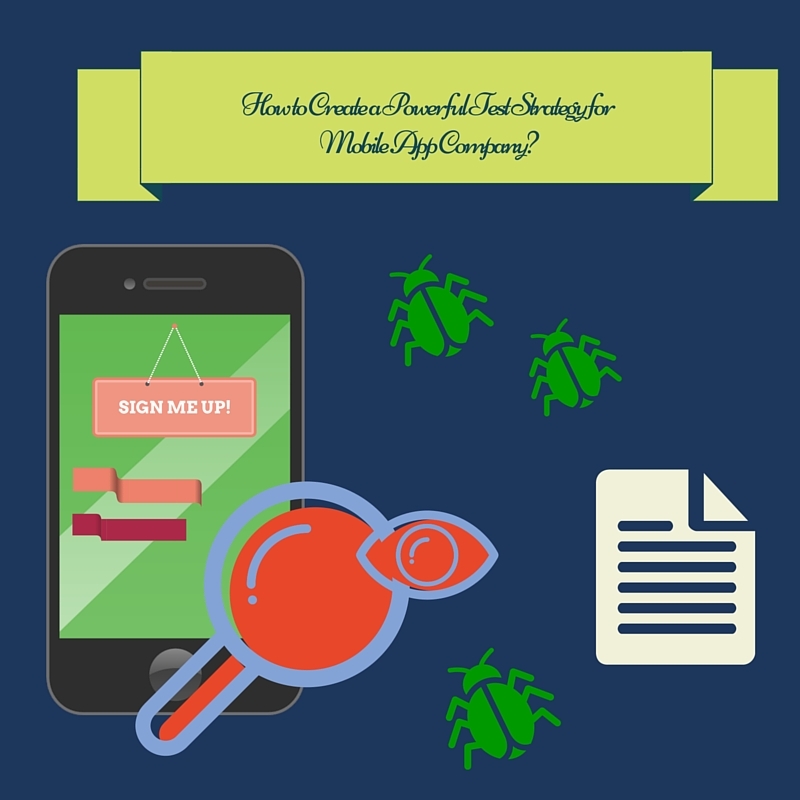 HOW TO CREATE A POWERFUL TEST STRATEGY FOR MOBILE APP ? There was a time when communicating with someone at a long distance depended mainly on the telephone that used to adorn the corners of a room. However, all of that has changed with the advent of the digital age when high end computers and mobile phones are the norm. Mobile technology has not only made it possible for us to be in touch with anyone, anywhere in the world at any given time; it has also completely transformed the way we carry out our day to day businesses and affairs. Judging by the way we are currently using mobile phones and their apps, we can safely say that this technology is here to stay and will play a greater role in the future as a major contributor to global change. Mobile app development companies regularly design and develop different types of apps for their clients which in turn helps them to reach out to a larger customer base and make sure that proper connection is established with the end users. In order to ensure that an app will be able to meet its expectations, it is of utmost importance that a mobile app development company invests in coming up with a powerful test strategy that in turn guarantees the success of the app before it is launched. Whats the Differences between Test Strategy and Test Plan ? Many people who are new to the world of web & application testing services confuse a test strategy with a test plan. Hence it is important to note the differences between the two at the very onset. Test planning involves a combination of strategies that together form the overall plan of the project. Every company has its own techniques, processes and standards when it comes to maintaining test plan documents. Some companies may include the strategy details within the test plan itself, whereas others may present the strategy as a sort of subsection within the testing plan. Nevertheless, the details are separated in the different documents associated with test strategy. While the scope of the project and test focus is discussed in the test plan, the test strategy deals with the guidelines associated with the test approach that is to be maintained for achieving the test objectives. It also deals with the execution of the various test types as mentioned in the test plan. The strategy deals with the test objective, test environment, test approach, automation tools and strategy as well as risk analysis along with contingency plan. While designing a proper test strategy document, it is important that the mobile app development company should focus on individual goals instead of simply adhering to the templates. If you are someone who is handling the task of test strategy development, you should consider what is best for your specific project. Every client needs to handle distinct requirements and you may work with those that serve you best. The following steps can help you to create your own test strategy. Here you should present an overview of the project along with vital information on the people who should use such information. You should also include details about the reviewers of this document as well as the parameters on which this document will be tested. Create the list of mobile app features and classify them under pre-condtion, basic flow, alternate flow & post condition. A simple example is when user need to signup. The various timelines in which different phases of the project are to be tested should be mentioned as well. The various aspects of the testing process; i.e. the basic parameters, levels of testing, and the team members along with their roles and responsibilities should be mentioned. For each and every test type that is defined within the test plan (e.g. unit, system, integration, regression, installation/uninstallation, load, performance, usability and security testing), you should describe the reasons for which it should be carried out. The other details that you should fill out include the time to start, the test owner, the testing approach, various responsibilities and all details of the automation strategy and tools if applicable. When it comes to test execution, different activities such as adding new defects, defect assignments, defect triage, re-testing, regression testing as well as final test sign-off play an important role. You should also define the exact steps that are needed to be carried out for each and every activity. You can either follow the same processes that you carried out in previous test cycles or come up with new ones. The setup of the test environment should outline all the information about the number of environments as well as the setup that is required for each environment. For instance, one test environment can be used for the functional test team with the UAT team using another environment. You should also define the number of users that are supported on these environments. The other things that are needed to be defined include access roles for the users, hardware and software requirements such as operating systems, overall memory, free disk space and number of systems. Before proceeding with the actual test procedure, you should also define your strategy for backing up and restoring your test data should anything go wrong. Quite often, the test environment database runs into issues caused by unforeseen conditions. This can be handled only with a proper backup and contingency plan at hand. You should also clearly define automation and test management tools needed for executing the test. The details about test approach and requisite tools that you put in the document define the attributes related to performance, security and load testing. The other thing that you must highlight includes whether the tools that you are using are commercial or open source and how many individual users are supported by it. You should make a clear list of all the possible risks that you may face. Next, provide a contingency plan or a technique by which you aim to mitigate such risks and make the most out of your test strategy.